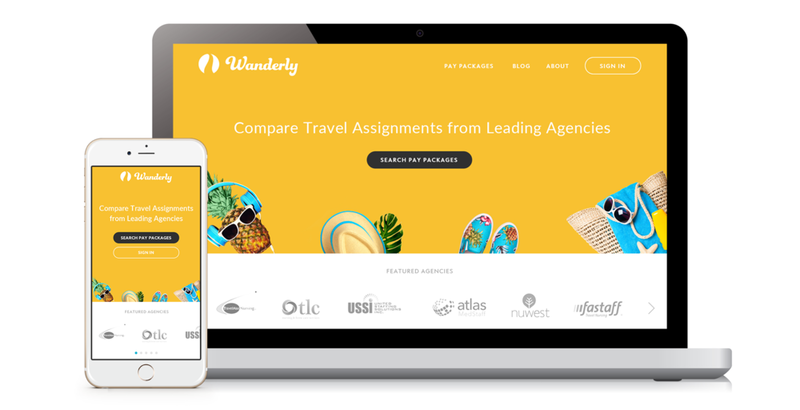 Wanderly is an innovative startup in the travel nursing industry. It's the Kayak for travel nurses in search of their next assignment - a need that was unfulfilled until the startup came along. As part of the Product Design team, I contributed to the UX process during requirements gathering, user interviews, market research, and wireframing. I also created all things visual design: logo and brand identity, marketing collateral, UI, social content, etc. In a sea of health-related symbols, I opted for a logo that spoke to the adventure aspect of travel nursing, and the company's goal to foster more positive and symbiotic relationships between nurses and recruiters. I also added an expanded brand color palette for a more fun and flexible identity. The 3 colors in the master logo represent the 3 sides of the company: nurses (yellow), recruiters (orange), and agencies (blue). We also moved away from aspirational nature photography and corporate healthcare images. Since we were making nurses' lives easier, we wanted to convey a feeling of ease and happiness, like being on vacation. So we created minimalist vignettes of items one may take to the beach, a mountain adventure, or ski resort. Prototype for agency/recruiter, demonstrating switching between Agency Profile (admin user) and Recruiter Profile (general user). We launched the company to nurses in Las Vegas, on September 18, 2017. For our booth, I created a backdrop that stood out, which had a positive impact on nurses attending - Wanda the Wanderly Pineapple also helped bring people to the booth. The agency side had its official launch in October. This scene ended in nurses chanting "Wanderly! Wanderly!" Self-care Sunday recurring post - since nurses use up so much of their energy caring for others, we felt it fitting to encourage their own self-care regularly. #TBT recurring post - celebrating important nurses in the history of healthcare. As part of the social strategy, I let myself be inspired by the traveling gnome phenomenon, and proposed we create a similar concept with a character that symbolized vacation and fun - enter Wanda. This plush toy is given to influencer nurses to take along on their adventures, and send us their Wanda selfies. It's a great way to generate UGC content, with the potential to scale and include partnership opportunities in the future. The digital version of Wanda - this is the design we used to create the plush-toy Wanda. Wanda edited into a jack o' lantern for Halloween. Nurse marketing email promoting new winter jobs. Recruiter marketing email inviting them to a pre-launch beta tester program (our way of populating the site with jobs before we opened the doors to nurses).